Greater Greenville real estate includes the Greenville, Laurens and Pickens Counties, but when most people talk about Greenville, SC they are talking about downtown Greenville, SC. There are a lot of reasons for the interest in the downtown area. 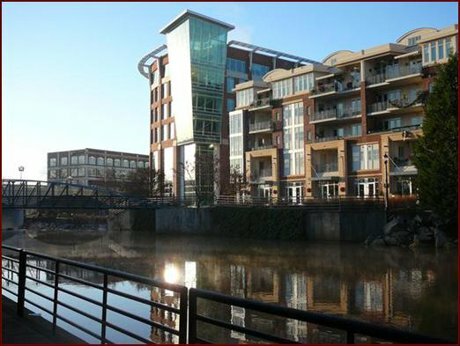 A great place to begin understanding downtown Greenville is along the Reedy River. Start exploring at the Liberty Bridge over the river, a 380 ft pedestrian walkway, which won awards for engineering innovation from the 2005 International Bridge Conference. It is overlooking a 60 foot waterfall in the acclaimed Falls Park on the Reedy River in downtown Greenville, SC. Downtown Greenville real estate for sale is sprouting up all along the river corridor, which is also the Swamp Rabbit Trail. These two good things, the trail and Falls Park are not near the reason things are booming in downtown Greenville real estate, but many of the good things center around these focal points. People want to be near the park/trail and retail, restaurants and homes or condos follow. Our vibrant downtown won the prestigious 2003 Great American Main Street Award from the National Trust for Historic Preservation. When you see how Greenville is today it's amazing to trace it back across time. See more on the history of Greenville County. Greenville, SC real estate listings run the gambit from converted small mill homes to large luxurious new mansions. Greenville real estate offers many facets depending on where you want to live and what you want to have quick access to. Downtown Greenville, SC is a fun place to live for retirees and young urban professionals with restaurants, plays, bars, events, outdoor parks and festivals. The towns around Greenville County have seen the success of downtown Greenville and the resulting increase in real estate prices. These increased prices for real estate and homes helps the Cities increase their tax base therefore giving them incentive to copy downtown Greenville, SC. When people talk about Greenville, SC real estate they are generally talking about downtown Greenville, SC, but Greenville County real estate transactions have increased along with the increase in downtown sales. The housing market in Greenville has encouraged a great deal of real estate investing. The Greenville real estate market conditions had 41% of all new building permits for the tri-county region of Greenville, Anderson and Spartanburg Counties in 2018 and 29% of those homes were high end. The Greenville real estate for sale currently has an average price of $345,100 from housing data gathered in 2018. When searching for Greenville real estate the months when listings were the highest were March - June with over 1000 new Greenville real estate listings for sale in each of those months. There are two parts of Greenville that are HOT right now and they both have "WEST" in their names. One is the West-End, which is the more familiar area and one of the first places that the boom in Greenville started because Falls Park is there. Now West Greenville is just starting to come up and is poised for the boom that the West End currently has because of a combination of the Kroc Center, AJ Whittenburg School and The new Unity Park. All these developments have grown up along the Swamp Rabbit Trail which runs through West Greenville. The village of west Greenville Real estate has already gone through the roof in terms of pricing. If you are searching for Greenville real estate look further along the Swamp Rabbit Trail for now. All of the areas mentioned above are in the greater Greenville MLS real estate area which includes Laurens, Pickens and Greenville Counties. If you are doing a Greenville real estate search start with our search tool and don't miss our Up to the minute current Greenville real estate Market Reports that you can customize.